Pairs and Packages: 20-810 lbs. American Made Colored Crumb Rubber Bumper Plates - Finally an American Made crumb rubber bumper plate with individually colored sizes for easy weight identification from any distance. Our high quality bumper plates are made from recycled crumb rubber harvested from car and truck tires that would otherwise end up being buried in landfills. These rubber tires are then stripped down and processed into rubber granules and then molded under high heat and pressure until fully Vulcanized. Vulcanizing is a process in which rubber becomes much stronger and tear resistant and has very similar strength specs to that of virgin rubber. Our recycled rubber bumper plates carry a 3-year warranty and are extremely reliable in the most demanding commercial environments, such as CrossFit boxes, school weight rooms and sports performance facilities. Our vulcanized blend of recycled rubber granules not only makes for an almost indestructible bumper plate, they also offer superior performance with a very low bounce. Further enhancing the structural integrity of each bumper is the center hub which consists of thick stainless steel for added strength and corrosion resistance. 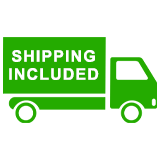 For your ordering convenience, weve configured bumper plate package deals that include shipping from 230 lbs. to 810 lbs. as well as bulk sets of only 45 lb. plates for CrossFit boxes and fitness boot camps. Custom configurations are available upon request and bulk discounts are offered for larger orders. Are you a Government buyer? Ironcompany colored solid rubber bumper plates are available for Government purchase through Ironcompany.com GSA contract GS-07F-0104M and CMAS contract 4-12-78-0066A. Warranty: 3-Year structural warranty against factory defects only included on 25, 35, 45 and 55 lbs. / 180-day warranty on 10 lbs. 10-55 lb. Pairs, 230 and 270 lb. Sets = UPS cost included within the lower 48 states only. 340, 460, 540 and 810 lb. Sets = Freight cost included within the lower 48 states only.